21/Al-Anbiya-1: Their reckoning has drawn near to mankind, and in heedlessness are they turning aside. 21/Al-Anbiya-2: When there comes to them a new reminder from their Lord, they listen to it while they mock. 21/Al-Anbiya-3: Their hearts attach no importance (to what Allah says) and those who do wrong counsel together in secret: “Is he (Mohamed) anything but a human being like yourselves? Will you then yield to the sorcery while you see”? 21/Al-Anbiya-4: (He) said: “My Lord knows what is spoken in the heaven and the earth, and He is the (All) Hearing, (All) Knowing”. 21/Al-Anbiya-5: They say: “Nay, medleys of dreams. Nay, probably he has forged it. Nay, he is probably a poet. So let him bring to us a Verse (Miracle) (too) as the former were sent”. 21/Al-Anbiya-6: Not one of the countries of those which We destroyed, believed before them. Are they the ones to believe? 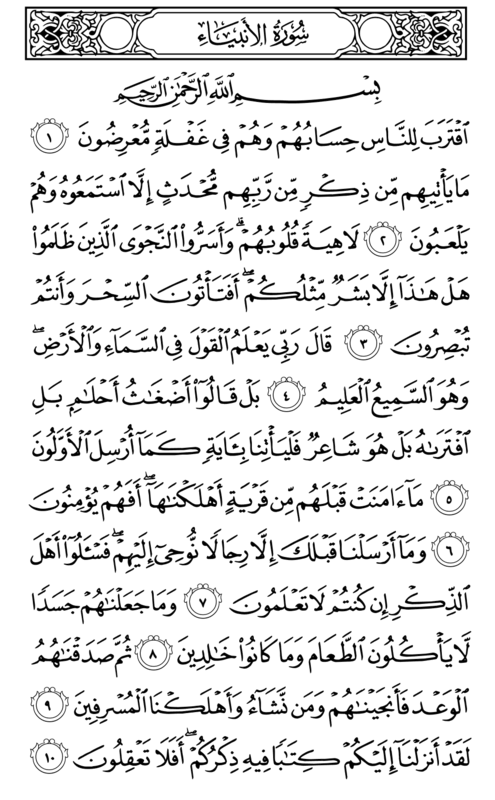 21/Al-Anbiya-7: And We did not send before you any but men to whom We revealed. If you do not know, ask the owners of the remembrance (continuous Dhikr). 21/Al-Anbiya-8: And We did not make them (the men that We have revealed) bodies not eating food, and they are not to live forever (they are not eternal, immortal). 21/Al-Anbiya-9: Then We remained loyal to the Promise. So We delivered them and those whom We willed. And We destroyed the extravagant. 21/Al-Anbiya-10: Certainly We have sent down to you a Book in which is your remembrance (which mentions you). Will you still not use your intelligence?